I note with interest that the Apache Lucene community has recently decided to merge the development of two of its best-known sub-projects: Lucene->Java and Lucene->Solr. As a result, both code bases now sit under the same trunk in SVN and Solr runs off the latest Lucene code at all times. Release artifacts will remain separate: Lucene remains a core search engine Java library and Solr will remain a search server built on top of Lucene. So why the change? The way things worked in the past, with many overlapping committers, quite a few features that could have benefitted Lucene ended up being placed in Solr. Such features may have “belonged” in Lucene, but due to dev issues, it was often best for Solr to keep certain features that were contributed by Solr developers under Solr’s control. If some of this code were moved to Lucene it could mean that a Solr committer who wrote and committed the code might actually lose the ability to maintain it without the assistance of a Lucene committer, and meanwhile, there could be long waits for Lucene bug fixes to be available in Solr trunk. With merged dev, there is now a single set of committers across both projects. Everyone in both communities can now drive releases (so when Solr releases, Lucene will also release), hence no more concerns about having to sometimes release Solr on a "development" version of Lucene. Now Solr will always be on the latest trunk version of Lucene. Also, Lucene benefits from greater test coverage, as now a developer can make a single change in Lucene and run tests for both projects. No matter how you look at it, it's a win-win situation -- one that probably should have happened sooner (but hey, better late than never). Wired reports that an aircraft known as Solar Impulse reached heights of 4,000 feet above land, during its 87-minute-long inaugural flight. The craft is said to weigh 3,500 pounds, with a wingspan of 208 feet and a cruise speed between 40 and 45 mph. In 2012, the plane will attempt to fly around the world nonstop. Follow the team via their Facebook Group. 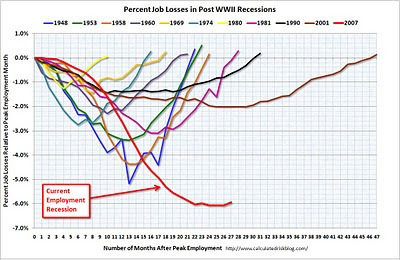 This excellent graph from Calculated Risk shows the decline (and recovery) in jobs as a percentage of the work force, over the last eleven U.S. recessions (from 1948 on). Click on graph for a larger view. 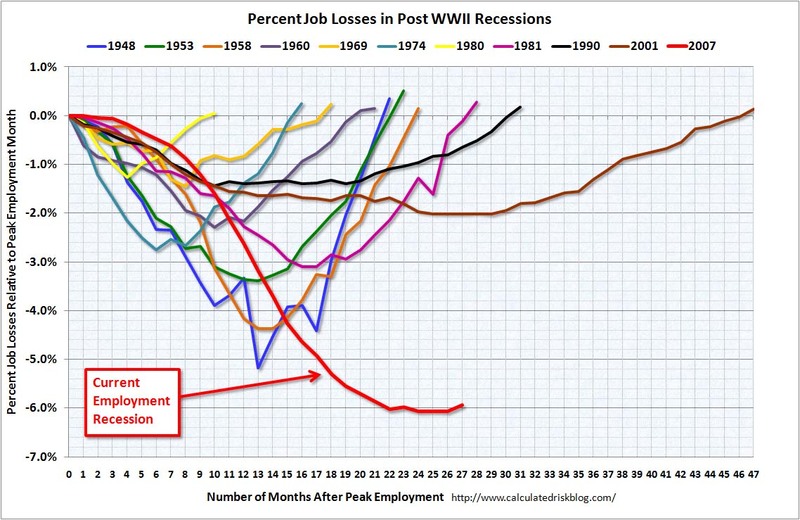 It's a scary graph, in that it shows the current recession clearly being the worst, for both the amount and duration of unemployment, in post-War history. On the other hand, it does seem to show that unemployment has leveled off and is turning the corner (ever so slowly). If past trends are any indication, we're now in for twenty-some months of employment gains. Still, it doesn't feel like the recession is ending. But I guess at the very bottom, it never does.